Last week was my three year old's first week of Pre-K. Yes, Pre-k. In case you are wondering why, read this post, Why I'm Sending My Three Year Old To Pre-K, then come back here. I thought the decision to send him was hard enough, little did I know, the first week would be the most eye-opening itimitdating experience. Between orientation, buying school supplies, paying fees, and leaving my son with people I had only met once before, I thought I was going to need an IV of valium to make it through. Then, the first day of school happened, and what an experience it was! Thankfully, I survived to tell the story. I tell you, nothing beats first-time parent ignorance. Silly me, I thought back to school would be easy and fun. 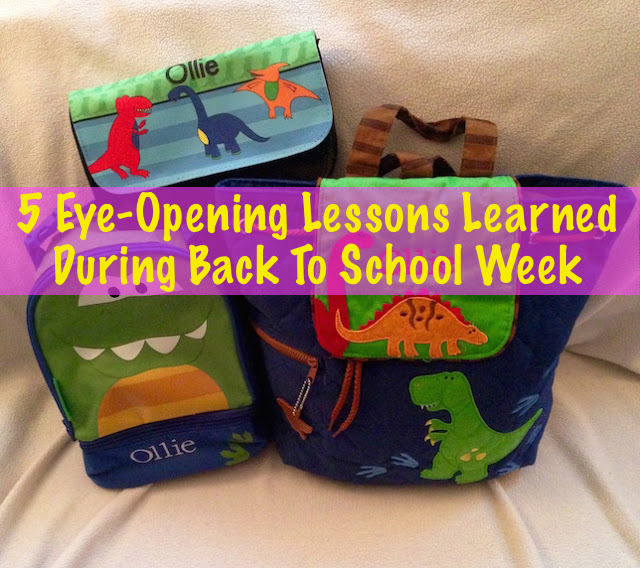 Below are 5 Eye-Opening Lessons Learned During Back To School Week. 1. It's A Whole New World- So much for the easy days of the 'Mother's Day Out' program Ollie attended 2-4 days a week at church. Real school is a whole new world. Picture it, Parents everywhere, children everywhere, kids crying, parents crying, photo after photo being taken in front of the school. Teachers shoving stacks of papers in your hand with lists, rules, expectations and snack rotation schedules, all while your child is clinging to you for dear life, begging you not to leave him in this madhouse. Yep, this was me last Monday. I'm not really sure what I expected, but I definitely didn't expect Pre-K to be so formal. Well, it is. You show up on time, you follow the rules, you read the lists, and you don't screw up snack rotation. 2. Your child isn't the only one crying on the first day of school. The first day of school was rough for both Ollie and I, but we were certainly not the only ones. It was beyond cute watching the moms and dads taking photos in front of school. Whole families were tearing up. At times I couldn't tell who was being more brave, the parents or the child. School is a huge step, yes, but it's also a huge reminder that our babies are growing up. 3. 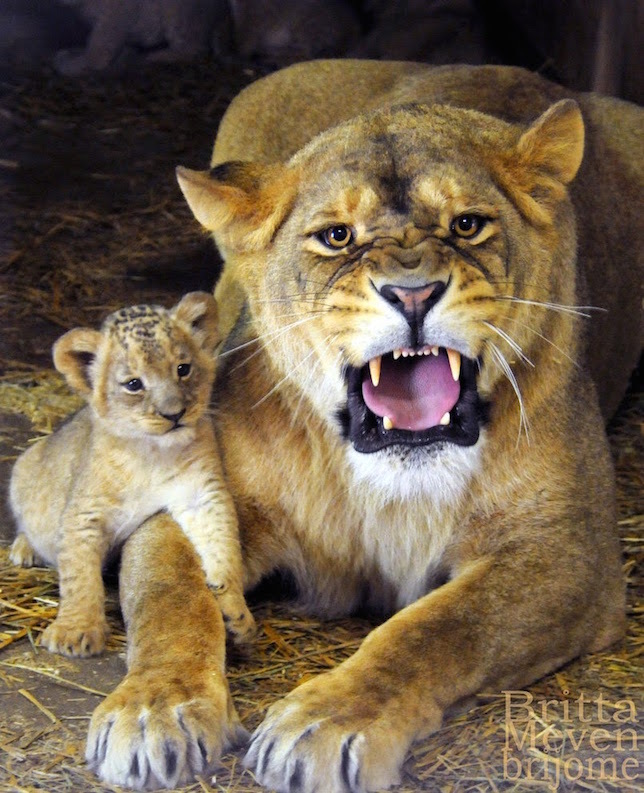 Moms bite. Hard. Especially in the morning. I get it. It's 8:30am, you're trying to get your kid in school and be at work by 9. But, the fact that it's a knock down free for all to get your kid signed in and in class and be back in your car in 4.3 seconds flat, is a little crazy. Thankfully, I am not that mom, so I am a little less rushed, but God help me for not getting out of the way of the mom that is! The mornings are the worst. I hope it gets a little less frantic over the next few weeks. 4. Organization is key. The stacks of papers didn't stop on Monday. Since the first day of school, I've been given a small forest in reading materials. I cannot get over how much there is to know about the school, Pre-k in general, State laws in regard to education and the ridiculous amount of activities, fund raisers and school events I'm expected to attend. Over the weekend, I bought a huge calendar just for schools events. I can't keep up with all of the stuff. AND THIS IS JUST PRE-K!!! What. The. Hell. At this rate, I'll need an assistant to keep up with my child's school schedule and extra curricular activities by first grade! 5. Make hand washing a household rule. There's no doubt about it, school is a germ paradise. It's full of germs, sneezes, coughs and miserable sick children whose parents had to get to a meeting. As most of you know, my husband works at a school for children with learning differences, which can call for close hands-on help with the students. By the end of FTD's first week back to school, he was sick with a cold. Two days later, I caught it. SOB! What a freaking early reminder that cold and flu season are at our doorstep, and with two boys in school, hand washing has become a MUST. I make the boys wash their hands the second they walk in the door from school. I refuse to spend the next six months in a sick boy sandwich. I'm still happy with my decision to send my lil' guy to Pre-K a year early, but it's certainly been one hell of a crash course in what having a child in school is like for a parent. I never in my wildest dreams thought it would be so demanding of my time or require so much organization and planning. Looks like my lil' guy isn't the only one learning and growing up as a result of starting school.